In a small nook amongst the streets of Brookland, a pizza place called Menomale serves its customers genuine Italian pizza. This pizzeria is not like a typical pizzeria; this is a place where you are transported to Italy. In the entrance of the restaurant you can see a genuine Neapolitan firewood oven decorated with a variety of colorful tiles, as the chefs chop, slice, slide, and serve the delicious plates. The owner, Ettore Rusciano, walks amongst his customers, greeting them with a heavy Italian accent, asking the waiters to serve his loyal clients their usual orders, and simply making sure his little Italian haven is working just the way he wants it to. After managing a restaurant in San Francisco, Rusciano was presented with the opportunity to open his own restaurant in D.C. His brother owns the building where Menomale is located today in Brookland and offered the place to him. Rusciano has never looked back. He drove all the way from San Francisco to open what his wife named Menomale, meaning “thank goodness”. Although Brookland is a developing neighborhood, Rusciano feels at home and is very happy with his decision to start his first restaurant here, compared to starting a restaurant in downtown D.C. or any other location. “It’s slowly growing and I’m very happy. The expenses would be doubled in downtown. I’m very happy with what the neighborhood offers,” said Rusciano. The restaurant has become a favorite amongst the community. Located close to Catholic University, it attracts mostly priests and teachers, Rusciano said. Menomale has also become popular amongst Catholic’s students, although Rusciano seemed surprised that his restaurant was so acclaimed by the young audience as he considered it to be mostly an attraction for an older crowd. “I don’t see a lot of students. I see students but not so much,” Rusciano said. Students mostly pick Menomale because of how close it is to campus. It’s only a 16-minute walk or a 5-minute car ride. When searching for a pizza place in the common delivery apps, Menomale comes right up, making it a great option when students want a gourmet pizza that will come to their dorm in less than half an hour. Menomale serves Neapolitan-style pizza, since Rusciano is a Naples native. He considers this style of pizza to be the most challenging to make due to the explicitly Italian flavors and ingredients it consists of. For him, the authenticity of his pizza is key to keeping his business alive. For this reason, Rusciano imports his ingredients from Italy or has a rigid selection process when shopping for them here in the US. 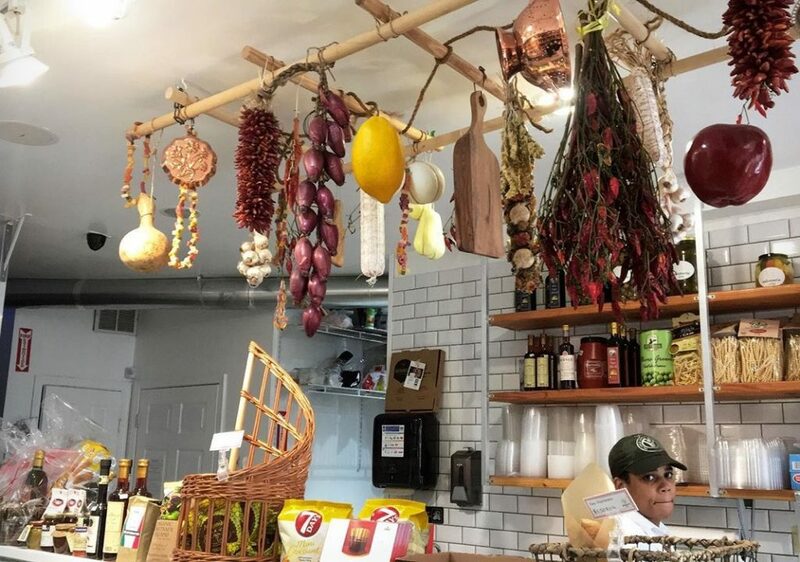 In addition to Menomale, Rusciano opened an Italian deli named “Salumeria 2703” which is next to Menomale. Here he makes homemade Italian pastries including chocolate cookies, cannolis, sugar donuts and more, all freshly baked and served. He also imports a variety of not just Italian produce but also European. He has Peroni beer as well as a selection of Italian wines, plus marmalades from Holland and more. The deli also serves sandwiches with 100% Italian cheeses and meats. Rusciano’s dream is to one day fill that entire street with Italian goodies, a concept he feels is missing in D.C.
“My dream is to make this an Italian block. Open more Italian concepts, since D.C. does not have like an Italian neighborhood, you know? It would be nice to have a little Italy in D.C.,” Rusciano said. Menomale has through its short years pleased the people of Brookland and will continue to do so because of the love and care its Italian owner has poured into his business. It is truly because of the dedication of Rusciano to keep his Italian heritage alive through food that Menomale has risen to the popularity it holds.